Episode 3: Fantasia | It's time to go to MARS and do so as FRIENDS! No mention of Chernabog? Come on, that guy is cool. Dance of the Hours was always my favorite as a kid. Clearly the best segment. I plan on watching the film tonight. I am very interested to see how my experience compares. Your expectation were either met or surpassed. Judging by how little you two liked it overall, I have to imagine I will be disappointed. But, since you two are notorious for your questionable tastes at times, perhaps a smack down is in the works. Yeah Chernabog was pretty interesting. Night on Bald Mountain was the darkest bit of the film for sure, and I remember that being one of the most impressive. But having seen it again… much like Sorcerer’s Apprentice, I just didn’t have all that much to say about it. That said, I was pleasantly surprised by the Dance of the House and the Pastoral Symphony. They turned me around on this one. 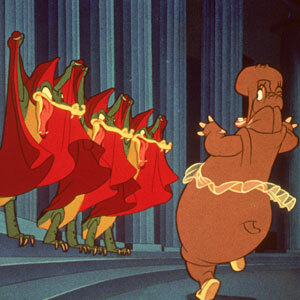 I think I liked Fantasia more than both of you. I think it’s more about experiencing the music first rather than plot. I think the animation was created more to supplement the music. I guess that’s the main reason why Donny didn’t like the film, since he wasn’t a classical music fan in the first place. I’m curious now though – how did you like Fantasia 2000? I really liked the flamingo and the jazz sequences in the 2000 version! I thought while perhaps less innovative, Fantasia 2000 was a more successful film in many ways. I enjoyed the music more and felt the visualizations were put to better use. I think the concept is neat, even in spite of the limited nature of my enjoyment of classical music. But I felt like overall the execution could be better – and was better in 2000. Really what it comes down to is, I’m more of a Chopin fan. It was an okay film. When did you most recently watch it? I haven’t seen Fantasia since I was like 6 or something. I remember watching it at my neighbor’s house and we danced around her living room. I need to watch it again. You two are doing really well, by the way! Hilarious! I might get in trouble for laughing out loud at my desk. Just realized where you got “rally” from. You’ve been watching too much Ghostwriter!